Have any of you seen this Sony Ad before? It's my first time. I love his face when he say's "Looking for someone?" Look's like a gq model in that suit. 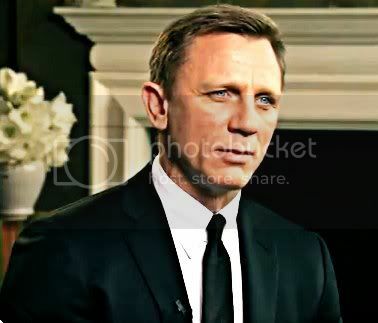 Which Skyfall interview could this be from? Found it on tumblr. Here's a small clip they just released of Skyfall. I can see why people are calling Javier Bardem's character a bit flamboyant. Interesting, and can't wait to see more interaction's between Bond and Silva. Hmmm according to Empire's review of Skyfall, Silva is "a loathesome foreigner with a hidden (and gruesome) deformity." I wonder what that deformity is? When I went to the imdb board, someone said it was his hair. Not going to lie, that one had me laughing. Still though, I wonder what it is? All these positive reviews are making me even more excited. I had a good feeling about this one. Felt that it was going to be great. So much talent in this film. Germangirl wrote: Heya gugita. BTW- how old are you know - 20? It's everything a Bond song should sound like; classy with amazing vocals and orchestra. Makes me forget about the abomination Another Way To Die.